We all know that Best Responsive Free Joomla Templates are very easy to use in wide variety of websites. You can use them in personal portfolios, business website or software firm according to your requirement. They are the most flexible and suitable for wide variety of websites. So we have just enlisted some of the best Free multipurpose Joomla Templates for you that you can ever find on the web. So scroll down and let’s find which Free Joomla templates are most suitable for your website. Read the description carefully and decide for which one you are looking for? 1 Here are the best Free Joomla Templates that you can use on your website. Here are the best Free Joomla Templates that you can use on your website. It is very easy to handle and is highly responsive. It requires no previous coding experience and is used to build a strong and attractive page within a matter of minutes. JM Supports template 3.7 Joomla Version and you’re sure to get a site with a very engaging design. Powered by EF4 Framework. This template is one of the most user-friendly, and robust Virtuemart Joomla template for Furniture Shop provided by As templates which provide the user to edit and customize his page according to his wish. The Bootstrap Framework makes it fully responsive to all screen resolutions and aspect ratios. Without any previous experience in coding, you can create some of the best visual effects using Logistica Pt. 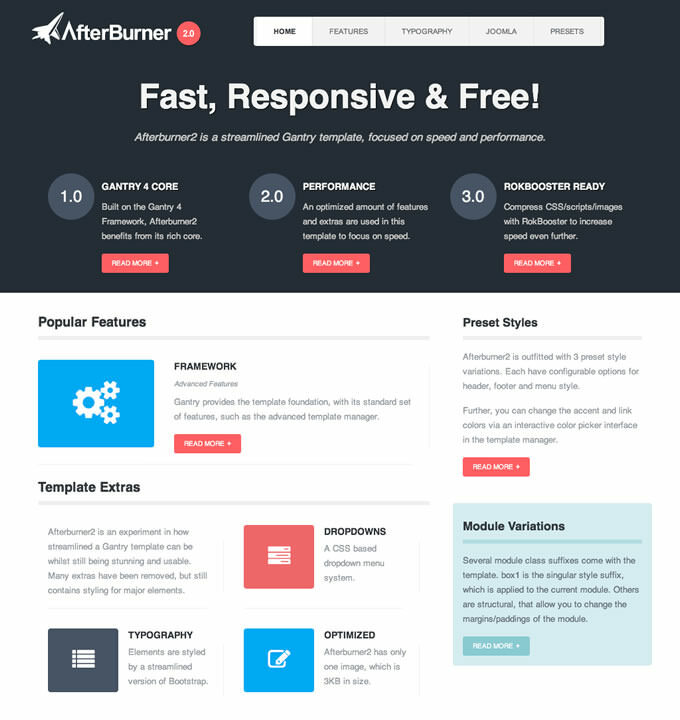 This Template provides Hundreds of unlimited customizations and built on slick warp7 framework. It is highly responsive and flexible for your Transport and Logistic work. With a responsive design, Tc Theme12 Free is one of the most widely Joomla template provided by Themes Creative(Joomla Template provider). It is quite fast and responsive with a great number of sophisticated tools and customizing options. JB FOODIFY is Template is one of the entire template ever made. This template is designed for Restaurant websites. It is delivered with proper arrangement of content, clearly – defined features blocks, stylish background in contracts to active page elements. JB Foodify will help you to build your Restaurant website in no time to your liking with minimal effort and coding knowledge. 63 Agency is a modern, professional theme that combines simplicity and elegance. It features a range of beautifully-designed particles that bring out the best in your content. The 63 Agency is a Fully responsive template which means it adapts to any device’s such as Smartphone, tablet or desktop. 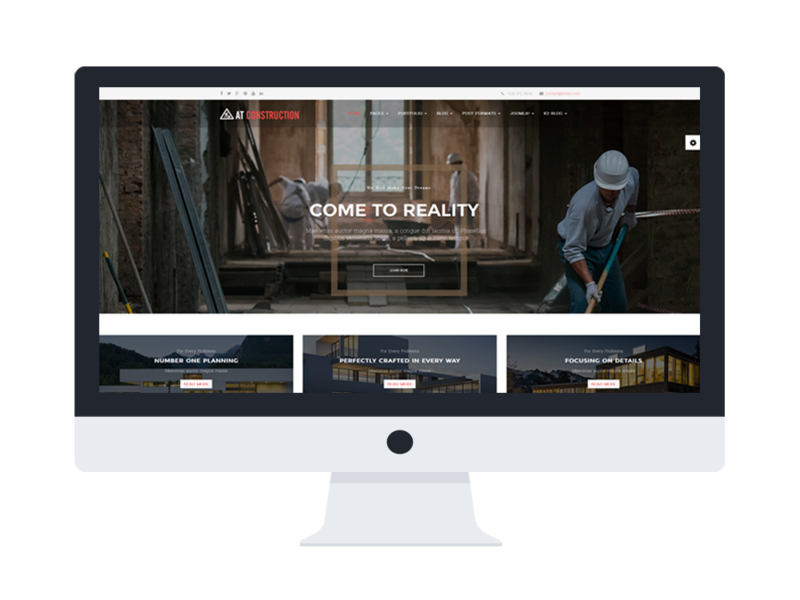 AT Construction is a professional Joomla template for House Design / Construction websites with a clean layout and elegant look. AT Construction has been built on fully Bootstrap CSS Framework, Support Font Awesome and K2 extended style. Which gives the template an immeasurable power of flexibility, agility, and fast loading. 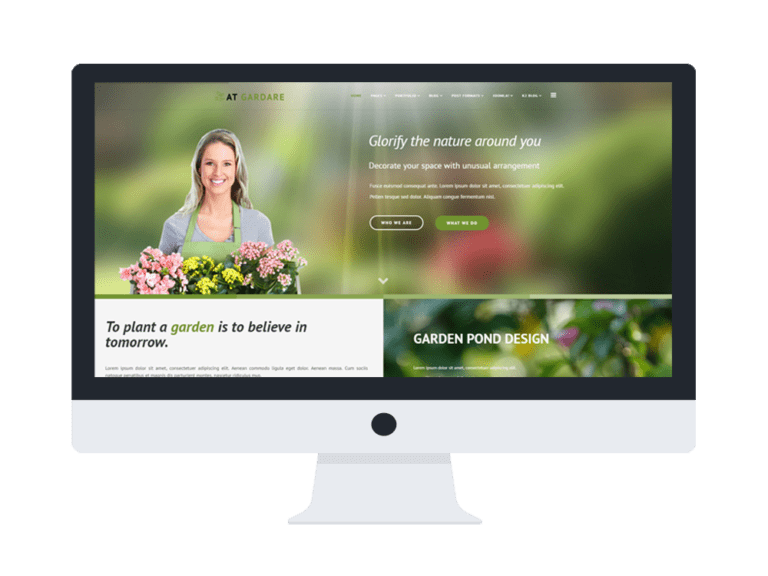 AT Gardare is a clean, modern design Joomla template specially designed for garden design or garden care website? It fully equipped by latest technology such as HTML5/CSS3 Bootstrap, and Mega Menu. AT Gardare Joomla template has full support for RTL language and will work on any device such as a tablet, smartphones. JD Boston is most famous Multi-purpose free Joomla Template with user-friendly, modern, highly customizable, moreover easy to integrate solution to build your custom Joomla 3.7 website. We can use this template to create an Agency, Studio, Corporate, Business websites. JD Boston template comes with VirtueMart integration which enables you to set up an online shop and sell your products. JD Chicago another Well known multipurpose Free Joomla 3.6.5 template which comes with an excellent layout from the creators JoomDev for versions 3.x CMS Joomla. So you can use JD Chicago Free Joomla Template for many purposes. Family Center is a free responsive Joomla template mainly tailored for a family-related website which comes with impressive features. Family Center is Fully-packed with Bootstrap features; it empowers the site with everything it needs to perform well online. Atlantica is super flexible, modern design Joomla template that can fit in School, Education or University website you are trying to build. It is responsive, clean, includes drag & drops Layout With stunning animations and eye-catchy layouts, Atlantica will help you draw the attention of visitors at first sight. Helix – II an excellent Free Responsive Joomla template. This template is also one of the best choices for business or any Magazine websites. Naturally, it will bring wonderful experiences to anyone using it. It was built in Helix V2 framework which is very flexible of using as well as customizing for the vast category of users. If you are looking for a responsive Joomla template that will transform your ordinary looking Joomla website into a professional business site then recently I found a new Joomla template, it simply gives your site a unique and fresh look with all modern features and flexibilities. It is best suited for Business agencies and companies. Radon has a unique feature that is tailored to the business website as it gives a new life to your site and so increases traffic to your site. It’s responsive design, compatibility with all browsers, SEO friendly codebase, and light design make it’s the first choice for wide variety of websites. IT Zen is famous for elegant and subtle design adapts perfectly with business, Blog, and portfolio based websites. IT Zen free Joomla theme is fully responsive, allowing for equilibrium between professionalism and commercial uses. IT is the charming design that you can ever found on the web. You can use one template to a different website because it has live customizer with lots of admin customization features so your website must be unique design. We can use this Joomla theme for any portfolio site, company, software firm, blog, personal website. JA Elastica is most scalable, super performance and SEO optimized, responsive, multi-purpose free Joomla 3.x template ever known to the web. It also gets fit in every site no matter big or small or huge corporate portals to studio or personal sites. JA Elastica made with JAT3 2 Framework and jQuery Masonry script and gave you massive features that you are looking for your website. Meet Gavern is a Responsive Multipurpose Template with latest Joomla technology, Fully SEO optimized, highly customizable and easy to integrate solution to build your custom Joomla 3.x website. You can use this template for Business, Company, Corporate, Creative, Fashion, Agency, Photo Studio, Freelancers, Portfolio Theme, etc. Meet Gavern build with responsive design, meaning your new site will adapt to fit any screen size, from desktops down to mobile phones. JM Services is a clean, bold design featuring the robust use of color, background elements, and a generous selection of individual particles that make creating your website a breeze, all configurable at the touch of a button. JM Services is engineered for every possible site layout, high speed, and exceptional flat design. JSN Force is a bold, elegant theme that blends dynamic content elements while maintaining a level of simplicity that is the hallmark of modern design. JSN Force is the perfect synergy of Virtuemart and Joomlashine. JSN Force is incredibly easy to configure with limitless versatility. ZenithII Joomla theme is the fully responsive industrial Joomla template for corporate, agency, nonprofit, freelancer or general business with attitude. 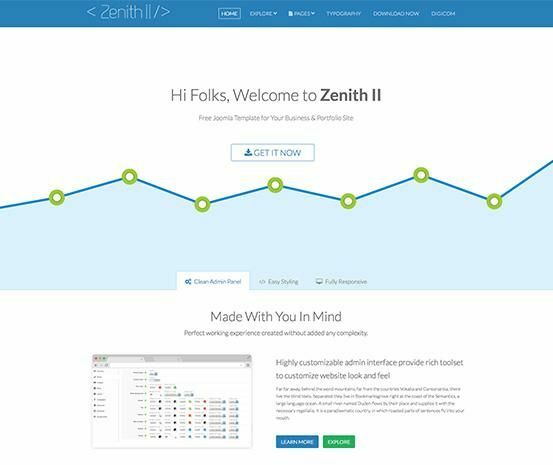 ZenithII Multipurpose Joomla template is built with Bootstrap, HTML5 and T3 Framework. Forte is a well-known modern and creative Joomla template, suited for any businesses or organizations. It is highly super flexible, with a clean and professional design. It is the perfect template to build a great website for your company. It is 100% responsive. Whether your users use tablets, mobiles or desktops to access your site, they’ll all have the same consistent user experience. Favourite is Free Responsive Joomla Template built with the Bootstrap framework, HTML5, and CSS3. It is a neat and clean Joomla theme containing 100+ module positions that have a collapsible 6 column layout, 48 module variations, 10 Preset Color Styles, 20+ navigation styles, 30+ Bootstrap Typography on homepage offering an impressive user experience to end user. We have managed our roundup of 20+ best Responsive free Joomla templates. What do you think? Which one did you choose? You can use them in a business website, personal portfolios or software firm according to your requirement.